In 1986, Greg Hildebrandt illustrated an edition of Pinocchio for Unicorn Publishing House. 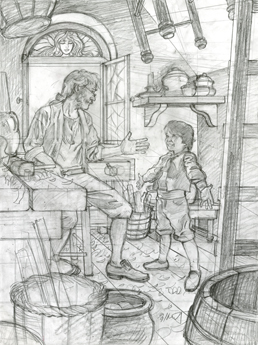 This beautiful pencil layout is a final drawing created for that book. Greg used this piece to transfer to the board for his finished painting. It is a one of a kind original by Greg Hildebrandt. Of all the stories Greg has ever loved, 'Pinocchio' has had a deep and profound impact on Greg Hildebrandt, and we believe that all of the love he has for this story was put into every brushstroke of every painting and every pencil stroke of every sketch!.